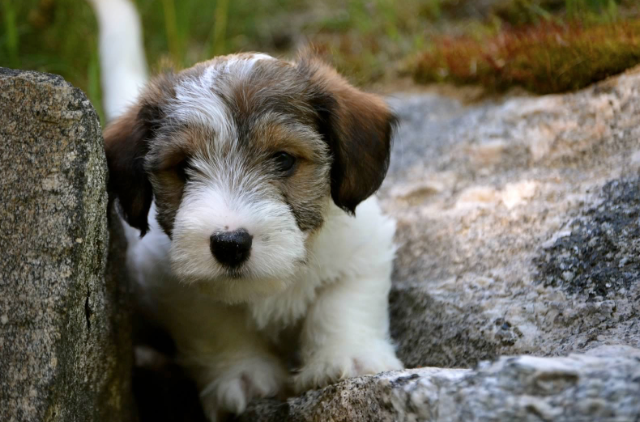 Within a litter you will find puppies with varying levels of confidence as well as energy. Just as you would expect all your children to not be cookie-cutter replicas of each other. In a well-bred litter from a responsible breeder, please don't worry about getting the last-pick puppy. 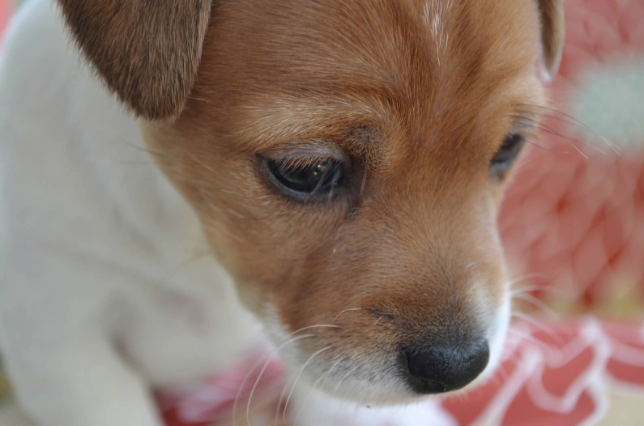 Each and every puppy in our litters will receive all of the necessary care and attention they need in order to grow up into happy, secure adult dogs. There is no such thing as "pick of the litter". Pick of the litter is the puppy that is best suited for your family. 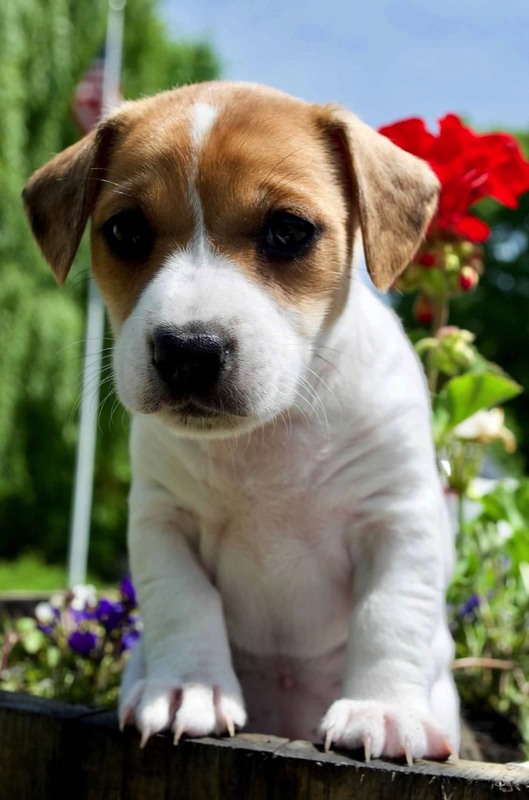 If you are indecisive, having trouble selecting your pup or find the process confusing, we will sense this and begin to help you weed out some of the pups. Sometimes it's little things you may not like as in the color, size, coat length or something cosmetic. If you like two puppies and all else is equal except for the markings - then feel free to go ahead and pick the one you like the looks of best. This is "Cassie" as a pup. She's a graduate of our Polished Puppy Kindergarten program. She's an adult now but is patiently waiting for a little CJRT brother to arrive in 2019. He will be brought home to Philadelphia. If you have small children (less than 5 years old) - Pick a middle-of-the-road puppy. Putting an active puppy with small children that he can easily intimidate is only asking for problems later. A very mellow, soft or insecure puppy might not be able to take the abuse even the most well-behaved children can dish out. If you have never had a dog before - Again go for the middle-of-the-road puppy or a softer puppy if you don't have children. A little less active puppy will make it easier for you to take control from the start. 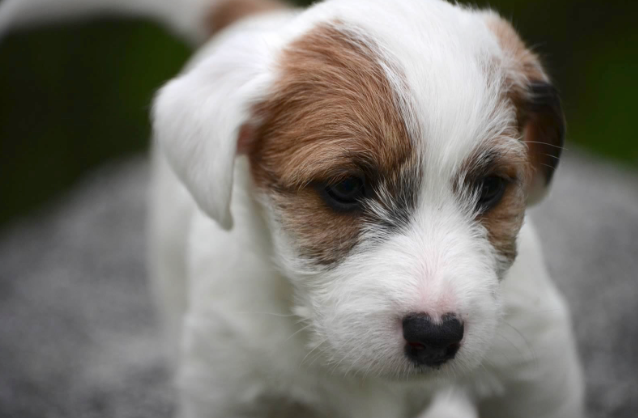 If you are a die-hard, terrier lover, dog savvy and active -You will do best with a more confident, outgoing, intelligent puppy. Those of you that are nodding your head and smiling right now - You have had dogs like this... and you prefer them this way. We happen to think they make the most wonderful adult dogs once they hit maturity (10-12 months of age). ...But then we are seasoned dog people like you. As well, if you are an experienced terrier person, we already speak the same language so in 10 words or less, you will be able to tell us exactly what you want and expect! ...And we will deliver. If you have special needs, health concerns or not too active - or simply in a more retired state of mind - You will do best with a middle-of-the-road to a slightly softer tempered pup. If you have an older child (over 5 years old) that fits this description, this is a great dog for them as well. If you or your child are confined to a wheelchair, or have other physical limitations, mentioning this fact is certainly not required but will help tremendously and we will go above and beyond for your family to help hand pick that special puppy. Remember you are not obligated to share these details - We just want to mention that we can select a pup that will take this special companion status more seriously. Most of our pups go to live in a typical family or companion dog setting. However, we have placed puppies with people who have specific special needs or with those that were looking for a working, hunting, service or rescue dog. The more we know about your circumstances, the more information we will have to help you through this process. Trust in the process. Know that we are educated in evaluating puppy temperaments and that we will do everything possible to stack the deck in your favor. This is a smooth coat Bella x Cooper Puppy. Our Connemara Terrier puppy "Cully". He's so much bigger now! "Murphy" as a puppy - He is Cully's brother.